This tea cosy has been made in pure merino wool. I have knitted it on my vintage knitting machine in a smoke and pet free home. The colours are white and mid blue with a white cord tie which gathers the top in. 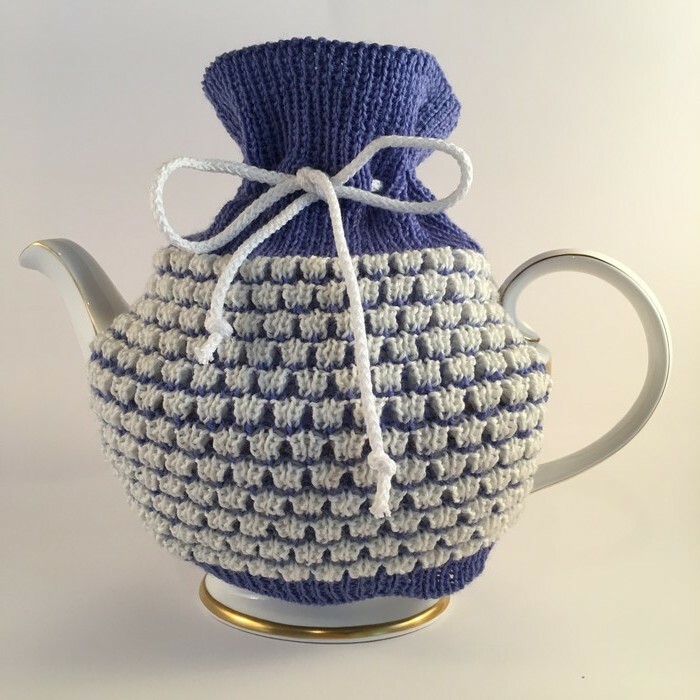 Both the top and the bottom of the tea cosy are knitted in mid blue while the main pattern is white and mid blue. Measurements:- 19 cms (width) x 23cms (height) - unstretched. It is photographed on a Royal Doulton 5 cup teapot. PLEASE NOTE THAT THE TEAPOT IS NOT PART OF THIS SALE.